Editor’s note: This post was originally published by The Otter and is the second in a series of posts edited by Tina Adcock considering the intersection between environmental history and the histories of science, technology, and medicine. In recent weeks, stories with pro-vaccination and anti-vaccination sentiments have appeared prominently in the news. They address the measles cases that originated in Disneyland and the fears of a significant increase in measles cases in Ebola-affected nations, where the latter disease has disrupted vaccination programs. In the Disneyland cases, media reports have highlighted the role of parents who refused to vaccinate their children. This is, in part, a legacy of Andrew Wakefield’s fraudulent research linking autism to the measles, mumps, rubella vaccine. These reports discuss the role unvaccinated children can play in diminishing herd immunity and spreading otherwise well-controlled “diseases of childhood” like measles, but including also mumps (see the NHL outbreaks from last year), rubella, and whooping cough. I follow the reporting on vaccines and infectious diseases fairly closely. I do so in part because I have two small children who are in the midst of getting all these vaccines (not to mention countless stomach, cold, and other not-so-fun viruses), but also out of more academic interests. There is a long history of unethical vaccination programs involving racialized populations, such as Canada’s First Nations, that parallels the history of anti-vaccination sentiment. Much of the history of vaccines and vaccine research has been written by historians of medicine and social historians. Yet environmental history has a significant perspective to offer as well. 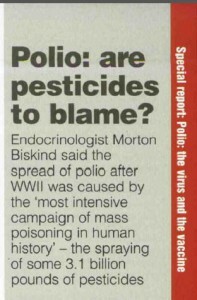 Excerpt from Janine Roberts, “Polio: the Virus and the Vaccine,” The Ecologist, May 2004, p.37. My research into polio has revealed a highly vocal, historical and contemporary anti-polio vaccination sentiment with interesting environmental dimensions. 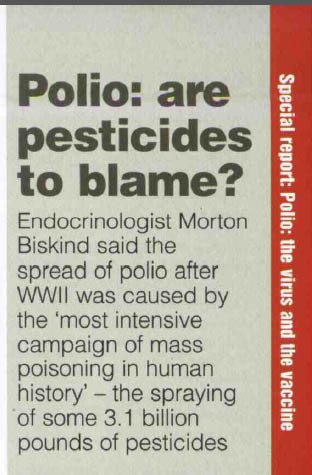 For instance, some who refute the efficacy of the polio vaccine argue that the disease itself is not caused by a virus, but by “industrial and agricultural pollution.” Hence, a vaccine is not the solution. Others refer to the writing of the American physician Benjamin Sandler, who published a book in 1951 titled Diet Prevents Polio. Sandler connected polio to large amounts of dietary sugars and starches, and went so far as to argue that the summer seasonality of polio was linked to the increased consumption of ice cream, soft drinks, and other artificially-sweetened foods in hot weather. Sandler’s work was discredited in the 1950s, and his findings received little attention from public health authorities. Nevertheless, the book was widely read, and his marginalization by health authorities likely only reinforced his standing with some of those who oppose polio vaccination programs. Ideas about “nature” and what is “natural” abound in anti-vaccination sentiment, whether in reference to polio vaccines or other diseases. I participated in a panel discussion at a conference where one of my fellow presenters argued that he had not vaccinated his children because he wanted them to build their “natural” immunity – through contracting diseases and recovering from them. Such sentiments are widespread among those opposed to vaccines. Those who emphasize the value and importance of vaccination programs espouse their own ideas about nature. In an article about vaccines that appeared in the November 2014 issue of Alberta Views, bioethicist Udo Schuklenk was quoted as saying, “The whole point of medicine is to deal with the disaster that is nature.” As environmental historians, we are well-equipped to unpack such discourses about nature, their complex cultural roots, and the kind of work they perform. Natalia Mehlman Petrzela’s work on natural motherhood is an excellent example of the kind of critical lens that needs to be applied to the environmental history of vaccines. Other-than-human nature is subjugated in a variety of different ways in vaccine research and production. To grow viruses needed for vaccines outside of the human body historically required other bodies. The classic example of this was Edward Jenner’s use of pus from cowpox blisters (albeit found on the hands of milkmaids, but contracted originally from cows) to inoculate against smallpox. George Dehner has described the continued use of eggs to grow vaccine strains of influenza, as well as how the need for supplies of fertilized chicken eggs was historically an impediment to rapid vaccine production. 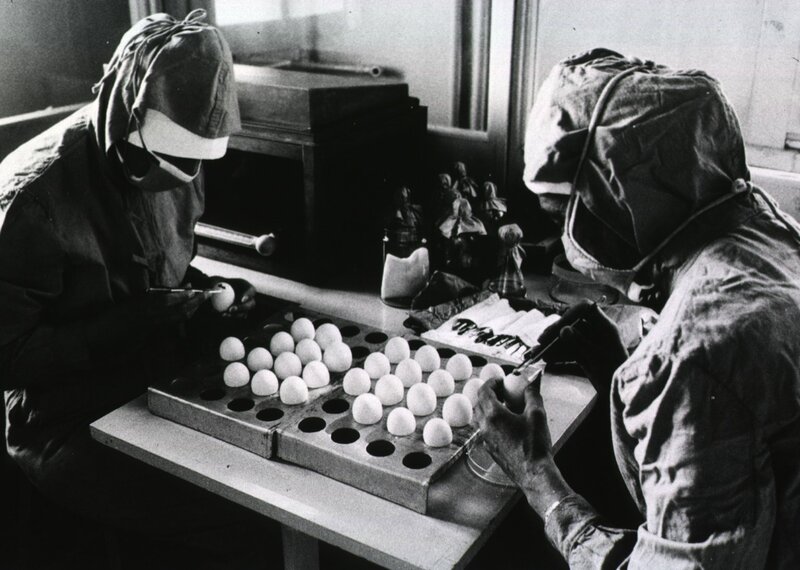 There is a significant, affiliated historical literature on the role of animals in medical experimentation, of which vaccine research and production was necessarily one part. Studying the environmental history of health and medicine can involve struggling conceptually with the role of “environments.” After all, for viruses and bacteria, the most relevant environment can be the human body itself. Histories of vaccines offer significant ways to connect the history of the environment as something “out there” with the nature that is found in all of us. Liza Piper is an Environmental Historian at the University of Alberta. She is the author of The Industrial Transformation of Subarctic Canada. Vancouver: UBC Press, 2009. Thanks to Chris Sellers for this insight into vaccines as a technology. Naomi Rogers, Dirt and Disease: Polio before FDR (New Brunswick: Rutgers University Press, 1996), 24. George Dehner, Influenza: A Century of Science and Public Health Response (Pittsburgh: University of Pittsburgh Press, 2012), 63, 166.
it is useful for me. thank you.